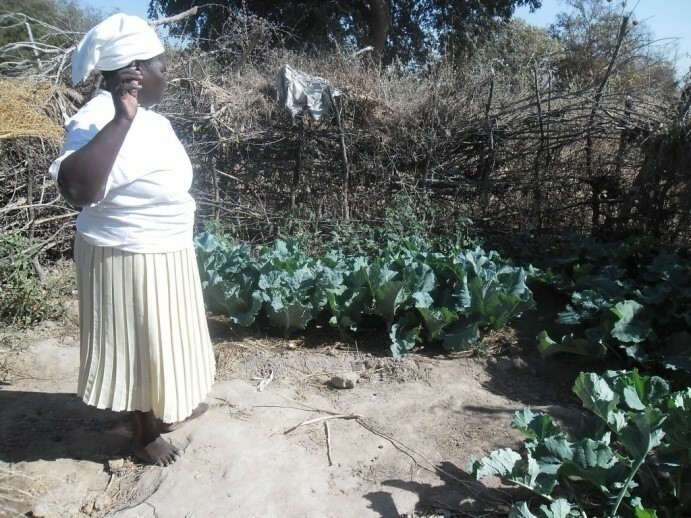 In 2014, Africa AHEAD (ZimAHEAD) partnered with ADRA Zimbabwe to train 250 Community Based Facilitators as well as Ward and District level government officials in Wards 8, 9, 33 and 34 including 8 schools on starting and strengthening existing Community and School Health Clubs to scale up public health promotion. 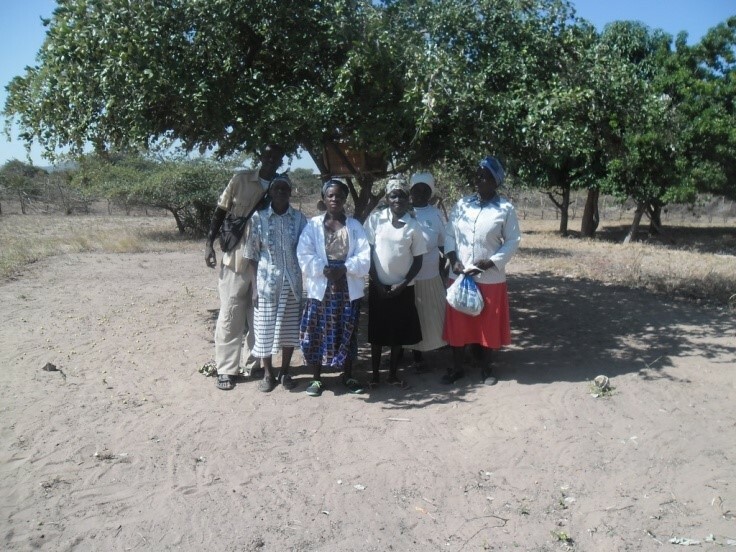 Bee keeping training was introduced for income generation to improve community livelihoods so that communities would be better able to self supply WASH infrastructure and improve their nutrition. The projects would also sustain community cohesion as villagers would network around productive projects. 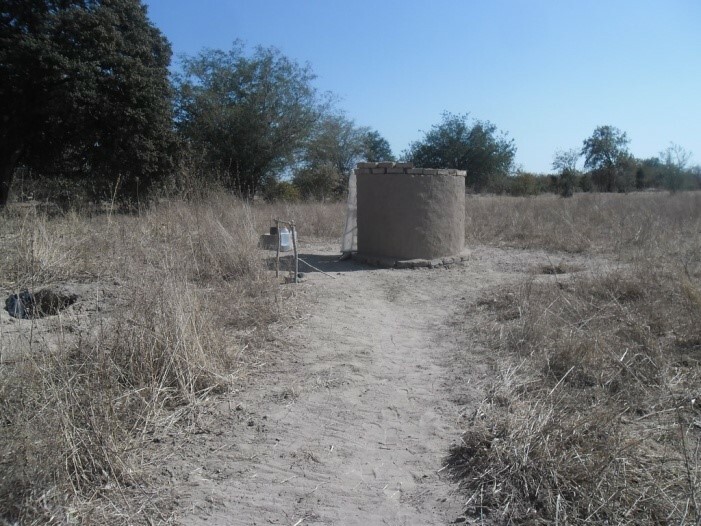 The Africa AHEAD Country Director, Regis Matimati was accompanied by Sindiso Mlobane an intern working with ADRA Zimbabwe and 3 ADRA Zimbabwe field staff members who run the program based in Gokwe North to do a follow up to see how the project started a year ago, had taken off. In Ward 34-, the team visited Mrs. Sithole of Kadozora Village who is a widow staying with her 2 children since her husband passed away 9 years ago. 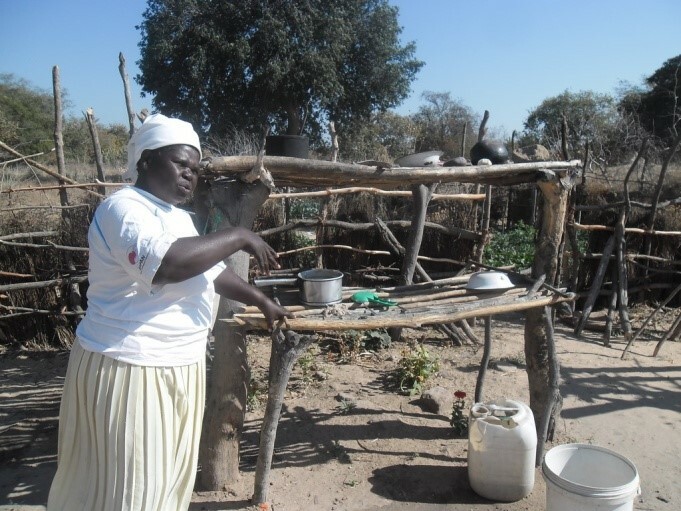 One of her huts collapsed with the incessant rains that hit Zimbabwe in the 2014/15 rain season. She has built another one and she fell off a scaffold in the process where she injured her hip and is in occasional pain. Mrs. Sithole is a very eloquent woman. She is passionate about community development and has constructed her own temporal latrine which she could not roof as she has no means. She had to stop building the latrine wall when she could not lift the bricks above her height as she was not going to risk the scaffold lest she falls again. There is another tippy tap close to her temporal toilet. The toilet is the second one she has made after the first one collapsed with the rains 6 months ago. Mrs. Sithole proudly took us on a trip around her home where she showcased her tippy tap for hand washing, the nutrition garden with a variety of nutritious vegetables which she waters from a shared protected well, situated some 150 m from her homestead..
She has a two tier pot rack for her dishes. Mrs. Sithole leads a group of 8 bee keepers (2 men and 6 women) in a plot she gave to the village for the bee keeping. According to Mrs. Sithole, one of the members is living with AIDS and the 4 women are widows. They also had approached the village headman who had approved the bee keeping project. They have made 6 hives which have not been colonized owing to having put no bees wax to attract the bees. During the discussion it was pointed out that the bees would not come if no wax was used. The villagers then liaised with ADRA Zimbabwe staff to facilitate fair distribution of the wax which had been handed to the ward committee for distribution among the clubs in the ward. 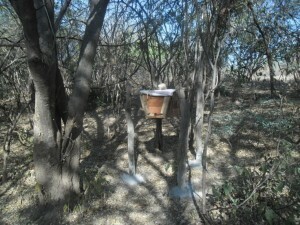 To make the hives the club members contribute $2 per person per month and they have used this to buy timber. They have also liaised with a hardware supplier to collect the timber breakages at a reduced cost. The community currently has no other source of income as they are reeling from a disease outbreak that killed a lot of their chickens. 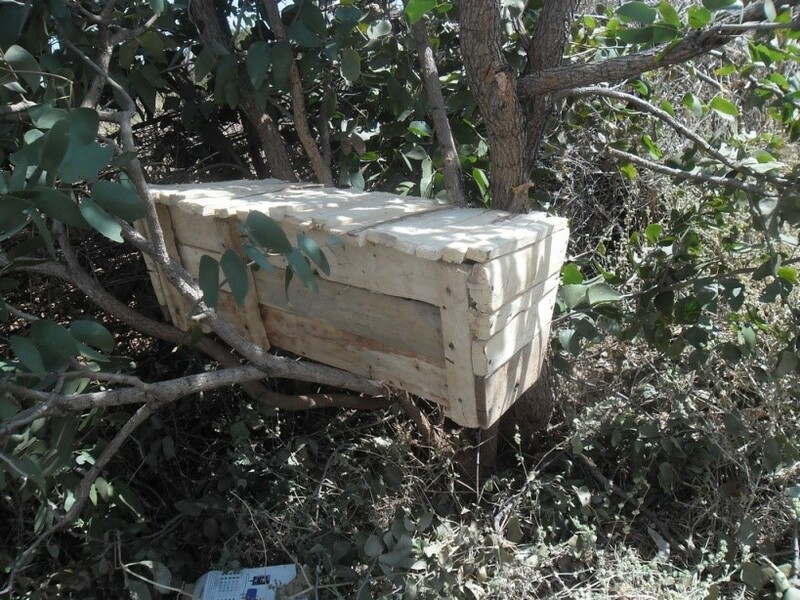 In the same ward Mr. Tinashe Murenga has made two hives of his own. He had to relocate his hives closer to his home for security reasons as his neighbor with whom he was working moved out of the community. One hive had been colonized but the bees have left due to an ant infestation. 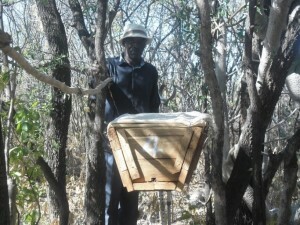 Recommendations to protect the hives from ants were given. He would re-wax and put wood ash at the base of the hive props once more. Mr. Emmanuel Mamutse uses 2 crutches to walk. He has 10 hives of his own since the training. All his hives are colonized and he already has harvested some of the hives and he is now a proud bee keeper. 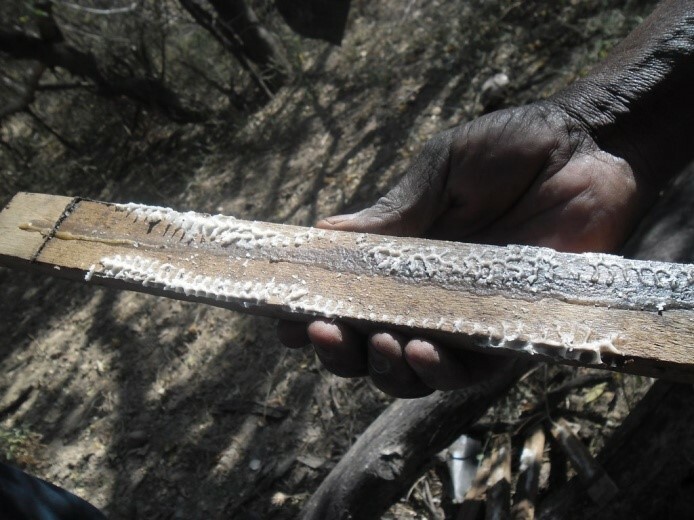 He has also made 3 bee smokers and has traded 2 in exchange with timber. He also sewed a bee hive suit for his relative in the neighborhood. He uses wood ash successfully to keep ants away. He has improved his own technique around making the smokers and the screen hats. He says the bushy area he has set aside for his project is now sacred as no tree cutting or veld fires will be tolerated around his home as it houses his bees. He is planning on setting up 10 more hives this year. The team was spoiled with some of the best honey we have ever tasted. The ADRA staff (Anslem) said they had visited Mr. Mamutse’s home and during one of the visit they had helped with the harvesting of one of the hives. 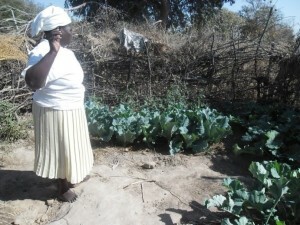 Mr. Mamutse sells his produce locally but may soon be trying distant markets. Mrs. Maramba has had 2 of her 4 hives colonized. She said the project was resisted by local leadership initially as a boy was stung to death by wild bees in her community recently before the project started. She and the other trained villagers took their time to explain the project and eventually won the local leadership over. 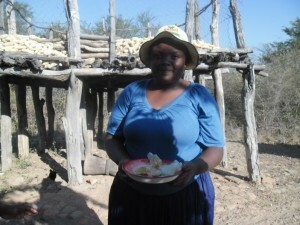 The project then started with 44 of the 50 households in the village joining. Local carpenters are also interested as they see the project as revenue source for them. 8 other people have shown interest by copying and setting up their own hives without coming to the training club. Eunice Moyo (the trainer) was away when we got to her village but her neighbor who is in the bee keeping club too us to the village headman’s house. Reportedly some young boys had stolen honey from one of the hives and the village head was demanding that the case be reported to him so that he could try the case and pass a deterrent sentence but the 10 member club had resolved to forgive the perpetrators for now but would report should this happen again. The club has 6 hives and three of these are colonized. They too need wax. 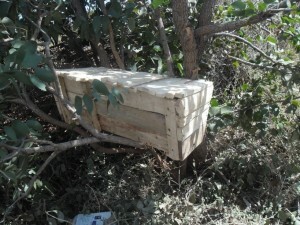 The 8 schools had not started making the hives as yet as they were waiting until they raise funds to procure the timber. The households visited are practicing optimum health and hygiene standards with tippy tapes, sanitation infrastructure, beautified clean kitchens, nutrition gardens and clean well kept household environments. This is evidence that the participatory health and hygiene knowledge transfer is bearing fruits. The clubs or individuals need continued support to trouble shoot around bee hive colonization as they need to put wax and to keep the ants away. Those that have managed to use wax and have kept the ants away have their hives colonized. 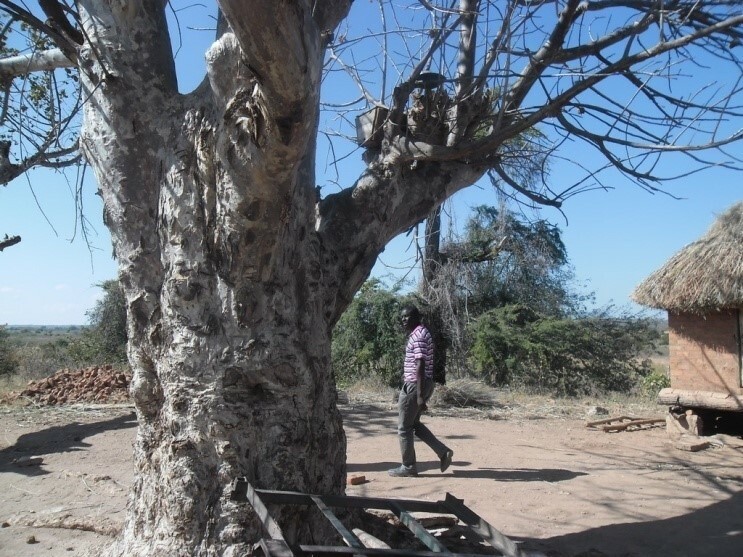 Working in groups has assisted in raising funds for timber but some enterprising individuals have been very successful and are saying they will be scaling up their projects. 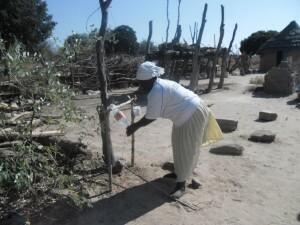 Cotton which is the main source of funds in Gokwe North is at its lowest prize and farmers do not have much to rely on to start the bee keeping project. Communities expected free bee hive handouts but this has slowly improved as they have not seen anyone getting free handouts. School Development Committees and school authorities to be encouraged to budget for bee keeping to teach the children and as a source of income generation for the schools. Public Health awareness and practice has greatly improved in Gokwe North. Bee keeping is picking up momentum and some farmers are already enjoying the produce. There is need for close support from the several government departments to back stop farmers in the projects.